The Decemberists have shared the second single from their forthcoming eighth studio album, I’ll Be Your Girl, out on March 16th via Capitol Records. Their first single, “Severed,” saw the band taking on a radical new electronic, synth-pop sound as they name dropped unexpected influences like Roxy Music, New Order and Depeche Mode, and they even said it started as a punk song. Synths follow the band into their new single “Once In My Life” though the acoustic guitar-led intro and outro give off the familiar comfort of a traditional Decemberists track. However, sandwiched in between the song’s edges is a spacey, synth-driven track that somehow manages to coexist with the indie-folk balladry of front man Colin Meloy’s lead vocals. This thing, this molten piece of spectacular extravagance, is available for pre-order now and will ship no later than June 15th, 2018. No fear: each pre-order will come with a digital download of the album that can be redeemed on March 16 (the four extra tracks will be available for digital download on the shipping date). 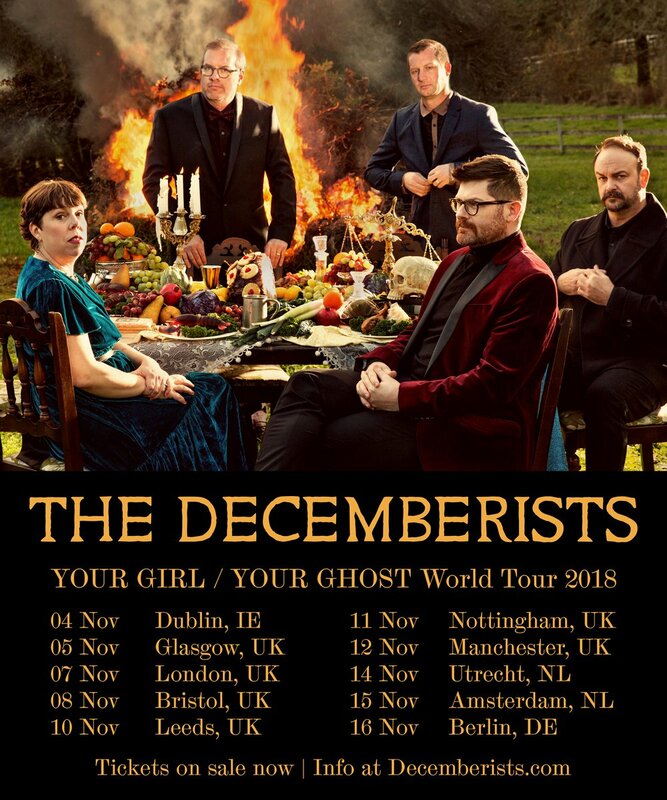 The Decemberists are back! Their band members include drummer Joen Moen, guitarists Chris Funk and Colin Meloy who takes lead vocals, multi-instrumentalist Chris Funk and Nate Query playing bass. This was the day 49 years ago that San Francisco rock band Quicksilver Messenger Service unveiled their finest hour, at least in commercial terms. March 17th, 1969 marked the release of ‘Happy Trails,’ their second album for Capitol Records and their one LP to win gold certification in America. When it comes to groups graced with two lead guitarists, one often earns more ardor than the other. Sometimes that’s understandable, like when one player takes more of the solos. But in a case like Quicksilver Messenger Service, it’s a mystery. In their heyday, John Cipollina tended to get more attention than Gary Duncan, though they both made dazzling contributions to their albums and concerts. Quite unusually for a sophomore record, ‘Happy Trails’ was a live album, taken from performances by the band at the famed Fillmore East and Fillmore West venues. Even more ambitiously, the first side of the disc was a suite of songs, running more than 25 minutes in total, based around the theme of Bo Diddley’s ‘Who Do You Love?’, in no fewer than six episodic interpretations. Quicksilver’s version divided into seven sections, with different sub-titles. One dubbed When You Love, featured a long, and highly creative, five-minute jaunt from Duncan that drew from jazz as well as psychedelia, underscored by a Latin-influenced bass line. It’s forceful and ruminative at once. Cipollina took the reins during the How You Love segment, letting his chilling tremolo spin through loop-de-loops, broken by distinct cries phased to shoot back and forth between the speakers. This is simply the San Francisco live,’acid rock’, sound at its best. Obviously comparisons with the Dead will be made but for reasons well expressed by the other reviewers here they are pretty meaningless. I can understand why opinions are divided over this album, It is one of the great, maybe the greatest, guitar album(s) flowing in a way that no other has ever equalled. Don’t look for structured songs here just, to quote the Airplane,”ride the music”. One of the two or three albums that would be in my top ten whenever you asked me. 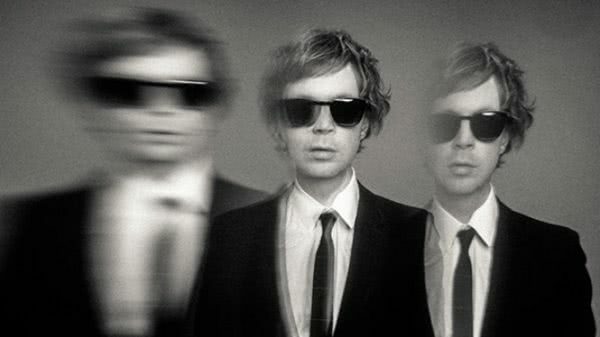 The album artwork was designed by Globe Propaganda, described as “an advertising agency specializing in hip, progressive material.” Soon afterwards, Globe designed covers for the Charlatans and It’s A Beautiful Day. 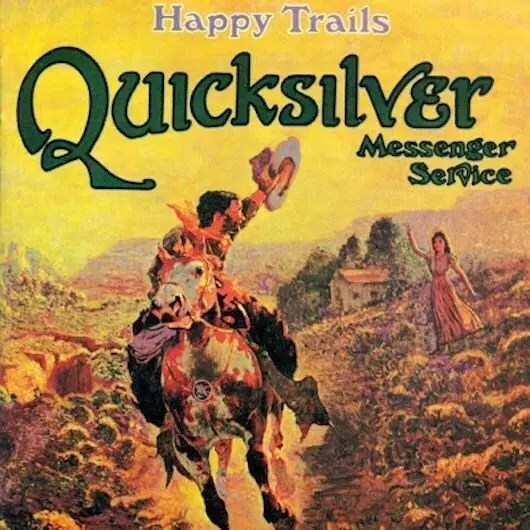 23 years after its release, in 1992, ‘Happy Trails’ went gold, testament to the lasting contribution of Quicksilver Messenger Service as was the fact that it landed at No. 189 on Rolling Stone’s all-time top 500 albums.